Back in the 1990s I was a regular reader of Threads Magazine and came across an article by Rosemary Eichorn with a raw edge collage technique that was new to me. The flowers and other images are 'fussy cut' out of fabrics and arranged onto a base fabric. No fusibles are used, just pins to hold the motifs in place. It is then covered in what I have come to call 'scribble stitch'. A vest like this uses more than half a kilometre of thread. The cotton fabric base and the collage on top are stitched directly to the lining, machine washed, assembled and bound to make a reversible vest. Here is my FIRST VEST. It is still around - although I haven't been able to button it up for at least 10 years now. I wore it and washed it and wore it and washed it... This is a current photo of it in all of its worn glory. 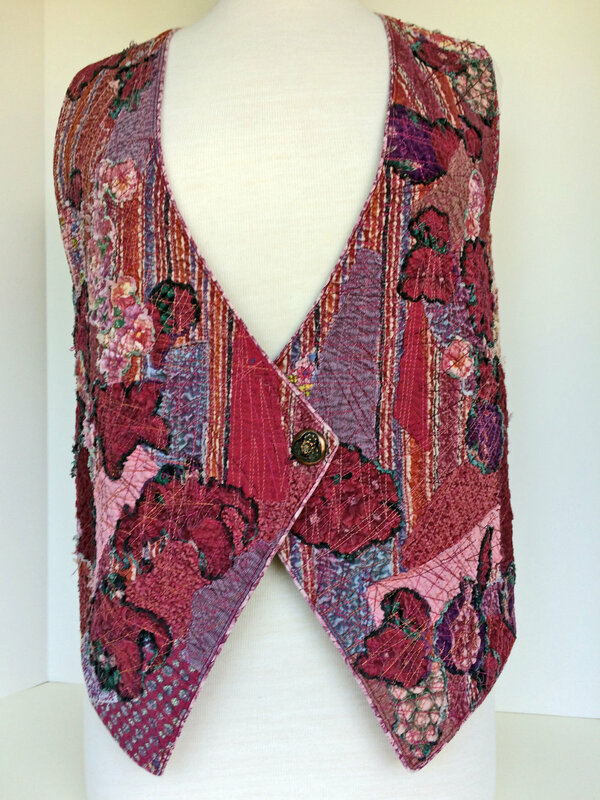 After making vests for a few years I came across a call for entry the second Common Thread fibre art show in Oakville. The show was juried by proposal. It seemed to me that a simple vest was not enough to gain entry into a juried show so I decided to create a poncho which would illustrate the world. My proposal was accepted and I had nearly a year to complete the work. I envisioned animals on each of the continents in their place on the globe and a spiral of water separating them. I had a lot of the images I needed but I had friends searching on all of their vacations for more animals that I needed. I cut out images as I received them and did not begin the design until about 6 weeks before the work was due. It was just barely finished on time. The Poncho won a juror's award at Common Thread in 2000 and the Wearable art Award at the CQA/ACC National Juried Show in 2001. I made this jacket for the show Games Needles Play in London Ontario in 2001. It won the Wearable Art Award. 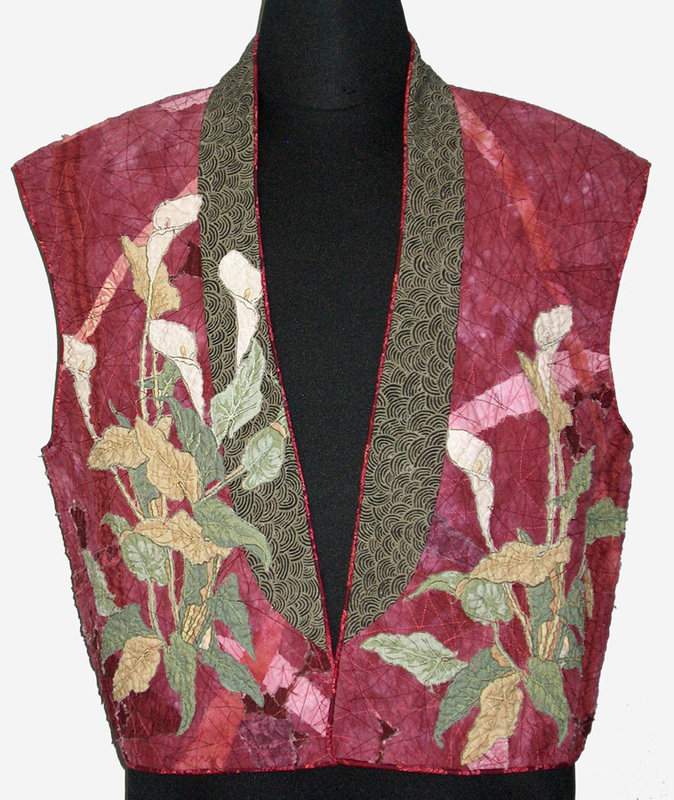 In 2003 the Calla Lily coat traveled to Charlottetown , PEI for the National Juried Show. It won the Wearable Art Award.